John Mallon, (right) Axiom’s Vice President of Client Service Operations, Europe, Orla Harris, (centre) Manager of Facilities and Procurement, Europe, present their cheque to Callum Clark, AMH Fundraising Officer. 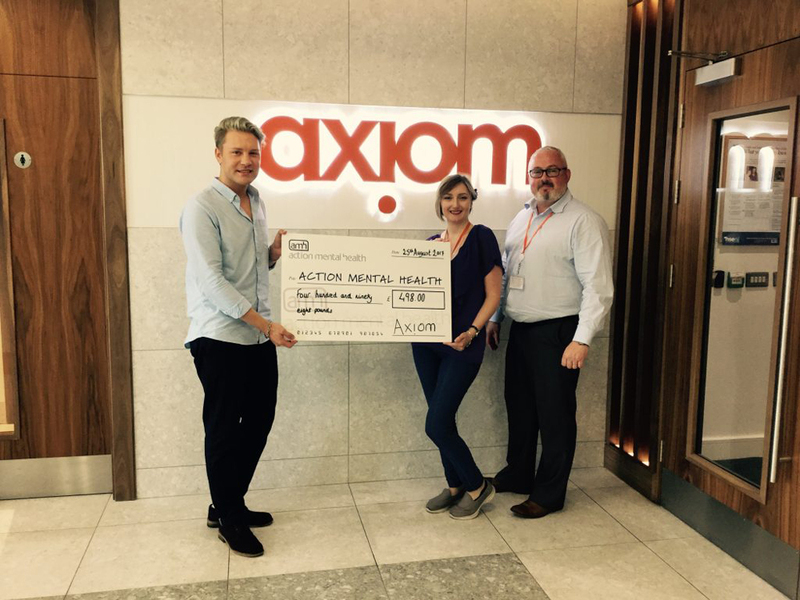 A global legal firm’s Belfast office has raised vital funds for Action Mental Health (AMH), by donating the proceeds of its annual summer ballot to the charity. The legal services firm, based in Belfast, raised £498 for AMH through its annual summer ballot which was this year held at Riddell Hall, and which also featured a family fun day. A number of local businesses donated a range of generous prizes for the ballot in support of the cause. The theme of this year’s eight week Programme was ‘Give My Head Peace’. The title was selected to help make the serious issue of mental health more approachable and engaging for team members. The ballot followed the firm’s recent participation in two Action Mental Health initiatives –Personal Resilience Training and Mental Health First Aid, two wide-reaching schemes designed to address mental health among the community. The two schemes were delivered by AMH Works, a mental health training consultancy service which provides quality mental health training programmes across Northern Ireland for employers to support healthy, resilient workplaces. Orla Harris, Axiom Manager of Real Estate & Facility Operations, explained the benefits AMH has introduced to the workforce. “We want team members to have the skills to not only recognise stress but to have the tools and support to manage it,” she said. “We chose AMH because they have a local understanding of mental health issues in Northern Ireland. AMH also offered tried and tested solutions to meet our needs, like the Personal Resilience Training and Mental Health First Aid. Some 73% of Axiom staff participated in the voluntary Personal Resilience training, learning techniques to identify and tackle stress, including an introduction to mindfulness training. Management say they’ve already seen the difference the programme has made on employees, with feedback being described as ‘extremely positive’. As a result, mindfulness sessions have continued to take place twice a week on site, while three yoga classes each week have also been introduced for staff. Employees have even been given the chance to express themselves creatively, being offered new writing sessions – ‘Write to Awaken’. AMH’s influence has further prompted Axiom to continue to offer similar support in the future, with four members of staff being trained in Mental Health First Aid.